The Best Watercolor Painting Youtube Channels from thousands of top Watercolor Painting Youtube Channels in our index using search and social metrics. Data will be refreshed once a week. About Youtuber Calming the soul, mediated the mind, learning and motivating to paint. Jay Lee is a specialized watercolor artist. JayArt videos are showing how to paint flowers, nature and other techniques on the various tutorials offered. About Youtuber Watercolor portraits, manga drawings, digital art and video tutorials! About Youtuber Welcome to my channel! I'm an aspiring artist from Melbourne, Australia, and here you will find all my videos about my work, tutorials with tips and tricks. About Youtuber Art Food Kitty is a channel devoted to art, food, and kitties! Watch painter Kelly Eddington create realistic watercolor paintings and make recipes. The art section includes how-to-paint and how-to-draw videos, speed painting, and other art and watercolor tutorials. About Youtuber I have created this channel to share with you, discuss and teach you how to use watercolors. I paint the traditional watercolor way where I use white as a medium and the other way around from dark to light, where I add white gouache (an opaque watercolor). About Youtuber This channel is for watercolor enthusiasts where I share tips and techniques in a quick, easy to digest fashion. I'll also do product reviews, offer challenges, look at other great artists' work and perhaps even have a few giveaways. About Youtuber We make Video Art Tutorials for beginners & advance level where we provide 4 tutorials each week about Watercolor, Acrylic, Pastel and Ink & Pencil drawings. Watch our videos for easy step by step guide for painting. About Youtuber I think art is about the freedom to embrace oneself, the joy of sharing love, and maybe....just maybe, leaving the world a little better than it was before. About Youtuber One of the best youtube channel for everything related to watercoloring tips and techniques. About Youtuber Hello everyone! Shibasaki is a watercolor lecturer. Welcome to watercolor channel. In this channel, I will introduce techniques and tips for drawing with the characteristics of transparent watercolor painting materials in an easy-to-understand manner. If you are planning to try it for the first time, those who are troubled if you do not improve easily with your own current. About Youtuber Hi, I’m Steven Cronin, a self taught watercolour landscape artist from Birmingham, UK. After leaving school at 16, it was nearly 20 years until I picked up a brush again at the age of 35 after buying a beginners watercolour painting set at a car boot sale in Brean, Somerset. About Youtuber Watercolours for the beginners and advanced students.. full lessons by Alan Owen. I attended art school in the late forties ,I have painted over seventy years in oils and watercolours .and painting was my occupation. About Youtuber Nitin singh is emerging indian watercolor artist with mastering in flawless strokes of watercolor. To him practicing watercolor is not a technique to make things beautiful, it’s a pure flawless collaborated journey with water and color along with your subconscious creative behavior. It's highly important to learn the language of water & color when it’s interacts with each other. About Youtuber I want to INSPIRE people to have the COURAGE to CREATE. My favorite mediums are watercolors and anything that has to do with ink. About Youtuber This channel is all about transparent watercolor and negative painting. There are demonstration and narrated tutorial videos as well as tips, techniques and best practices. About Youtuber Hi! My name is Carrie and I'm a Watercolor Misfit-also known as a media media artist. Here on my channel you'll find watercolor tips, painting tutorials, and a lot more fun content revolving around art! If you are interested in painting with me, I would love for you to join my latest watercolor course, which you'll find the link below. About Youtuber Hello! My name is Alisa Vysochina, I'm a freelance illustrator, primarily working with watercolor. About Youtuber Pen, Pencil and watercolor tutorials. A professional Artist for many years, my focus is now on smaller works, Urbansketching and sharing my techniques. About Youtuber Online watercolor classes, tips, tutorials and more from me, Anna Mason. Watercolour artist with a passion for nature, colour, realism and helping people learn to paint! About Youtuber This channel is designed by New York based artist Ekaterina Smirnova. It will include watercolor demos and tutorials, art show reviews and more. About Youtuber Hello! My name is Yong, an artist and art educator. My passion is to share with you the world of art as seen through my eyes. These instructional videos are in-depth technique demonstrations and painting processes along with other aspects. Collectively, these videos form an easy and fun learning system, which are informative and entertaining. About Youtuber Welcome to my channel ! New painting videos uploaded every Sunday . Thanks so much for watching ! About Youtuber Angela Fehr is an internationally known watercolour artist and instructor living in in northern British Columbia, Canada. Fehr emphasizes fluid and intuitive painting, teaching technique clearly and encouraging students to explore their own unique style as they develop watercolour skills. About Youtuber My name is Bao Pham and I create time-lapse videos of my gouache and watercolor paintings. About Youtuber Self taught artist, Psych major, Lover of astronomy. About Youtuber Watercolor demonstrations inspired by some of our great contemporary watercolorists for beginners and more. About Youtuber Find Watercolor painting, seascape, nature, occen, sunset, animals,speed painting and everything related to painting on video painting youtube channel. About Youtuber Are you struggling with watercolor painting? Want to paint in a loose style? Don't know what to paint or have problems with composition in your art? Then sit back and watch some of my painting tutorials on a wide range of subjects (mainly landscapes). Nearly all of the watercolour demonstrations are recorded in real time (there's over 40 hours of them!) with step by step commentary. About Youtuber The Video Showcase of Professional watercolour artist Peter Woolley. About Youtuber Hello I'm Margaret Morales, an aspiring watercolor artist. Welcome to my youtube channel! About Youtuber My Painting Channel provides free, full-length painting demonstrations of oil and watercolor paintings. No time lapse videos so you can paint along and see everything I do. About Youtuber New Painting Tutorial Videos EVERY DAY! About Youtuber Watercolour landscapes, buildings, trees, and seascapes are all covered in my step by step watercolor videos demonstrations. Patrick Ley-Greaves is an experienced watercolour artist and tutor, he will help you overcome basic and more advanced problems in watercolour painting. About Youtuber Demonstrations of traditional and novel watercolour techniques. About Youtuber Cafe Watercolor is one of the best youtube channel for everything related to watercolor painting. About Youtuber I paint realistic watercolors and teach my own unique method of painting. I provide free inspiration, art friendship, painting tips and some paid lessons on my website, because anyone can learn art. About Youtuber Welcome to my channel of Watercolor & Wizardry where I post informative original art instruction, Golden Age illustration & fine art Masters Studies, and art book & product reviews! Park your brushes here and let the epic watercolor, gouache, and ink adventures begin! About Youtuber Welcome to my wonderful world of loose watercolours, I hope you find inspiration from this style of painting and you try it yourself. About Youtuber I started painting 40 years ago with watercolours and but for some encouragement from wife's cousins staying with us from Australia, I might have quit. I discovered Big brush watercolour by Ron Ranson and was bowled over because he made it look so easy with the 2" hake brush which I am now demonstrating. About Youtuber I'm Alison Fennell - I am a freelance watercolour artist specialising in very fully explained step by step tutorials for the beginner. I will show you everything - from paper wetting to paint mixing so that you don't miss a thing! About Youtuber Thanks for visiting my watercolor painting channel! I'm Jennifer Branch, a professional artist who has made my living painting for over 20 years. I've taught painting workshops internationally for 20 years. Everything you need to know about watercolor painting is here. About Youtuber Sharing my watercolor techniques and information. Subscribe to learn about all aspects of watercolors, for beginners and beyond. About Youtuber Hello, My name is Erik Lundgren and I have been working as an artist since the early 80s. Mainly watercolors. My videos show how I paint with watercolor. About Youtuber Ever wanted to learn how to do modern calligraphy or paint watercolor flowers? I post weekly videos on my YouTube channel to help you learn! About Youtuber I'm a self-taught artist that specializes in ink and watercolor. I have a spectrum of styles, from loose & dreamy to colorful & cute. Art is my life's passion and teaching others to illustrate freely & confidently is what I aim for! About Youtuber I am a watercolor artist and teacher in Lehigh County, Pennsylvania, specializing in detailed, realistic paintings. About Youtuber Artist and illustrator, Olga Peregood guides you through a playful exploration into watercolor world as a tool and source of power, enthusiasm and creativity. About Youtuber I'm a self taught watercolor artist who has been painting watercolors for about a decade. I've tried several different styles and techniques to paint everything from apples to zebras. After all this time, I feel I am beginning to develop a style all my own. About Youtuber Painting with watercolor. About Youtuber EPC Art Courses organizes quality art retreats with the best watercolor artists in the world. About Youtuber Beautiful and vibrant watercolor paintings from the studio of Graham Berry. About Youtuber Watercolor painting with international teacher, Karlyn Holman. About Youtuber Urban Sketchers are an all-volunteer nonprofit dedicated to fostering a global community of artists who practice on-location drawing. Our mission is to raise the artistic, storytelling and educational value of on-location drawing, promoting its practice and connecting people around the world who draw on location where they live and travel. About Youtuber Here I share with you some of my tips about painting with watercolour paints. Tips which I have found useful in my years of teaching other people how to make a difference to their work. About Youtuber Australian born, Heidi Willis is an entirely self-taught Natural History watercolour artist. Heidi's artworks are in high demand both privately and commercially, with original paintings regularly selling out. She is a freelance botanical illustrator for Australian Geographic Magazine and her and her masterclass tutorials are booked out over a year in advance. About Youtuber A professional Artist watercolor,drawing and urban sketching. About Youtuber Watercolor tutorials, speedpainting and more by Swedish watercolor artist Christian Koivumaa. About Youtuber Watercolor process videos and tutorials. About Youtuber Learn how to paint in watercolor by following my straightforward tutorials. I will guide you step by step explaining clearly along the way the techniques I use. So come along and lets paint in watercolor together. About Youtuber Sheila Gill Watercolour Artist Workshop Video's. About Youtuber I love to travel and paint the world in watercolour!! About Youtuber Speed painting videos of contemporary watercolor portrait paintings by artist defectivebarbie. Based in Los Angeles, California. About Youtuber Watercolor Weds is dedicated to the art of watercolor painting offering new watercolor tutorials every Weds. Our mission is to create a worldwide community of artist who enjoy watercolor, want to learn new techniques, want to master the art of watercolor and who support each other along the way! About Youtuber I am a beginner free artist who paints with watercolor. About Youtuber Welcome to WATERCOLOR by Scarlett Damen your private online watercolour Art School. Here you’ll find lots of watercolor painting tutorials for beginners and new artists with simple step by step classes covering how to use watercolour and basics beginner watercolor techniques. 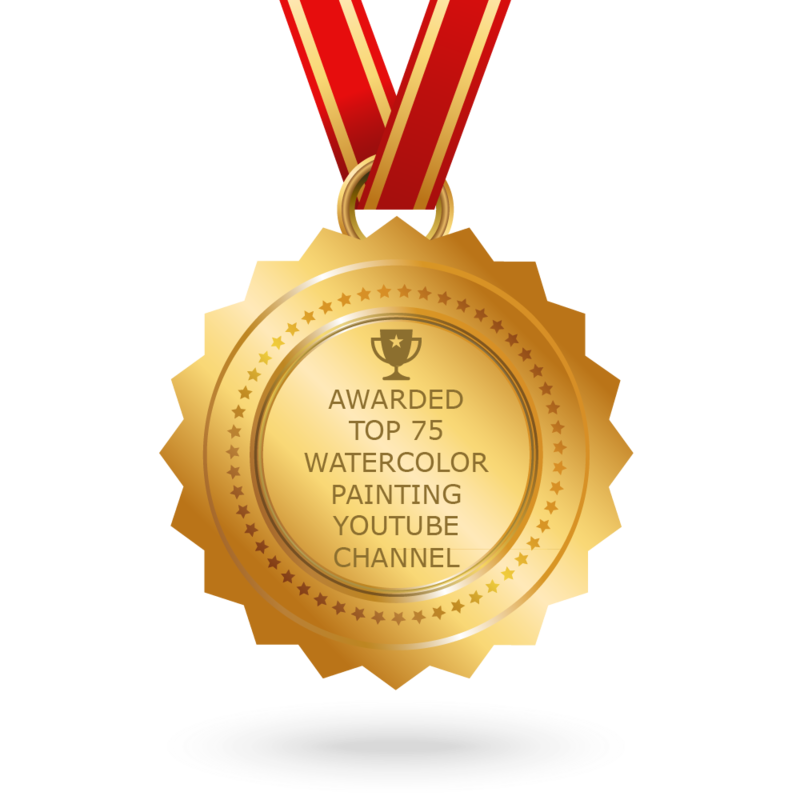 CONGRATULATIONS to every youtuber that has made this Top Watercolor Painting Youtube Channels list! This is the most comprehensive list of best Watercolor Painting Youtube Channels on the internet and I’m honoured to have you as part of this! I personally give you a high-five and want to thank you for your contribution to this world.